Dermatillomania is a disorder that I had never heard of before joining the Picking Me team. I was shocked to find out that 4 percent of all people are affected by it and how it affects every aspect of their lives. It is hard to grasp that such a common disorder had no advocacy groups until Lauren McKeaney decided to start Picking Me. Those who suffer from dermatillomania are an underserved community with few outlets for help and support. It is truly amazing seeing the support from people across the globe for this cause and it feels really good to be part of an outlet that is dedicated to helping them. I can’t say enough good things about the work Lauren and the rest of the team puts in everyday. Everyone in the office truly believes that dermatillomania advocacy is important and is dedicated to doing their part in an attempt to spread awareness to help those who suffer. Although most of our office does not suffer from dermatillomania, we understand how lonely people with the condition must feel and we do our best to help them. This help ranges from selling fiddle packs to sufferers to simply having a conversation with them to take a peek into the life of what it’s like living with dermatillomania. While working at Picking Me, it has been amazing to see how supportive other organizations and companies are to our cause. While setting up events and looking for donations to help our cause, I was shocked to see all the donations that companies would send to help us raise money for Dermatillomania advocacy. It goes to show that if you see a problem in the world that needs solving, you should do something about it, and others will help you. 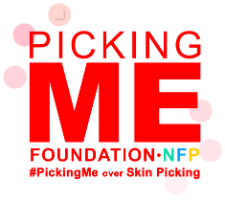 Working at Picking Me has helped shape how I view the nonprofit sector and all the lives that it can impact!